I turned forty something today. My (lovely) wife knows me well. Among several thoughtful gifts were two scrolls redeemable for full car support for a huge Alps ride anytime in the next 12 months. 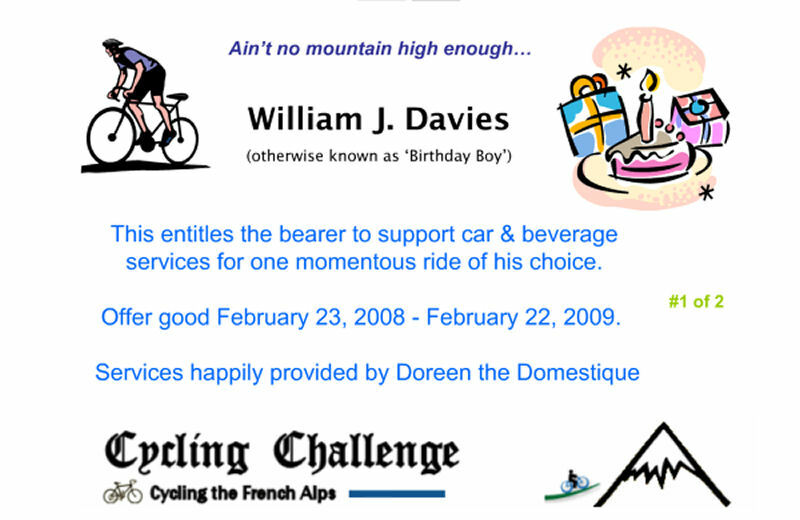 I still have very fond memories of Doreen’s support car services on Ventoux last year. On a hot day, fresh water bottles every few kilometres and a bum push to boot. Jealous riders were everywhere. And better photos than I could ever take. 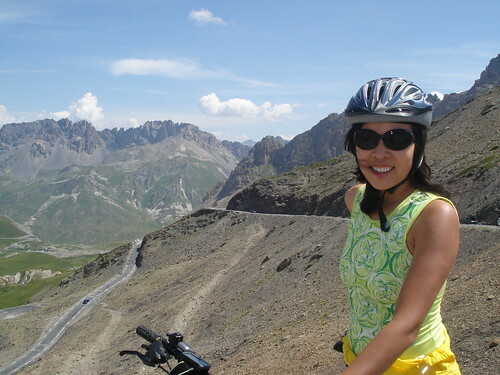 Doreen is no slouch and has successfully climbed stuff like Alpe d’Huez, Ventoux and Galibier (photo). A very creative and thoughtful gift. No doubt they will come in handy to support this year’s challenge. You are a lucky man to have such a great wife. You are a lucky 40-something man, Will. Many happy returns. Good! I remembered this week that you had said that you would turn 49 ;-D very soon. I felt guilty as I thought I had missed it and was figuring out how to apologize next time I see you. But I get you right on the day. CONGRATULATIONS!!! And lovely idea from DtD. Very sweet card. Need to tell Katy to have a look on Cycling Challenge so she can pick up how to be a good KtD. Your are a lucky man Will. “Doreen the Domestique” is awesome. I AM SO SORRY FOR MISSING YOUR BIRTHDAY… HAPPY HAPPY BIRTHDAY! Just think of the great shape you are in for turning 40. I’ll hit that next year. Guess I better hit the bike. CHEERS! voilà un cadeau plein d’attention et bien pratique, bravo à Madame !